I mentioned in last week’s Naturalist’s Corner that I found the decision by US Fish & Wildlife to kill barred owls in an effort to save spotted owls intriguing on many levels. I will use this week’s and next week’s columns to outline a couple of those intrigues. It’s no secret that the Endangered Species Act has become the lynchpin of conservation. Critical habitat designation has been used to preserve hundreds of thousands of acres and sometimes, as in the case of the ivory-billed woodpecker, just the perceived presence of some iconic creature can prove pivotal in raising money and/or support for land acquisition. I don’t fault environmentalists and/or environmental organizations for using whatever means they have to protect sensitive environmental areas. And I realize that preserving habitat has become a high-stakes legal enterprise requiring legal underpinnings like critical habitat designation that comes with the Endangered Species Act. But I often think that we, as environmentalists, have the cart before the horse. To paraphrase James Carville’s succinct advice to then presidential candidate Bill Clinton – when it comes to protecting species – it’s the habitat, stupid. Protect the habitat and you’ve de facto protected all the organisms that call said habitat home. 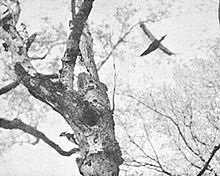 Perhaps habitat is too ambiguous or too amorphous for people to connect with, while a spotted owl or an ivory-billed woodpecker is more tangible. Or perhaps it’s just so intuitive that we don’t consciously focus on it. I mean, if you’re a photographer and you want to get some good butterfly shots, where do you go? You go where there are lots of blooms – why – because it’s the right habitat. If you’re a hunter or a fisherman or a birder or a biologist you can simply look around you and you can list a suite of species that you would expect to encounter at that location. If you take a spotted owl out of old growth forest, or take an ivory-billed woodpecker out of bottomland hardwoods they won’t survive. Now, I’m not saying you couldn’t raise them in captivity. I’m saying they are part of a larger whole. They are part of an ecosystem – a habitat and they have evolved with that habitat and they depend on it for their existence. And there are any number of other organisms that depend on that habitat, some we’ve probably never even heard of. The All Taxa Biodiversity Inventory has turned up more than 900 species new to science in a habitat that is largely second growth and sees millions of visitors a year. What might be discovered if thousands of acres of old growth and/or bottomland hardwoods were afforded the same kind of scrutiny? At this late date of plunder of natural ecosystems in this country and around the world, we can’t afford to take our eye off any tool that gives us leverage to halt it. But we need to redouble our efforts to focus on a larger, more holistic, more sustainable picture. Aldo Leopold often called the father of conservation, once stated, “To keep every cog and wheel is the first precaution of intelligent tinkering. …” Yet here we are, destroying entire ecosystem and we don’t even have a parts list. We have no idea of what we are destroying. We need to put the horse back in front of the cart. There must be a way. I mean if the Supreme Court can give corporations individual rights, why can’t we list endangered habitats?